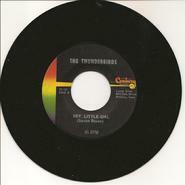 In 1966, the Thunderbirds recorded two of their original songs (Hey Little Girl and Those Days are Gone) on reel-to-reel tape in their machine shop rehearsal space. These recordings were subsequently produced and released on a Century record label 45. Unsatisfied with the sound quality, the band re-recorded the songs. The instrumental tracks were laid down in a recording studio in Kansas City. The vocal tracks were produced at the Sears Recording Studio in Omaha. The new record was released in January of 1967 on the Libra label. The Century record was never formally distributed or sold. 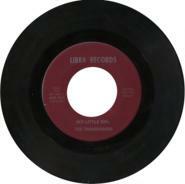 The Libra record was sent out to Iowa and Nebraska radio stations and was sold by the band at concerts and gigs. The Libra label is the one that ended up being sought-out by collectors as one of the most valuable and collectable 45’s from the era. There are a very limited number of these in circulation (exact amount unknown). It now appears that copies of the original Century label record have surfaced! As a result of all this, the band has decided to offer for sale a limited number of their personal copies of both the Century and Libra records through this web site. Based on recent internet traffic, it appears that a fair price is $750 for the Century record and $1,000 for the Libra record. Both of these are in Mint (never played) condition. Both 45’s are in the original dust jackets and will be signed by the band. Serious rockomaniacs - click here and check out #34.